The Representation of the People (Amendment) Bill of 2017 has been introduced by the government in the Parliament. 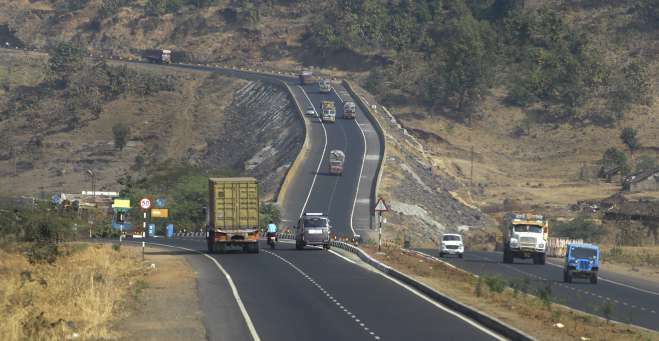 The National Highways Authority of India has created a National Highways Investment Promotion Cell (NHIPC) for attracting domestic and foreign investment for highways projects. The cell will focus on engaging with global institution investors, construction companies, developers and fund managers for building investor participation in road infrastructure projects. 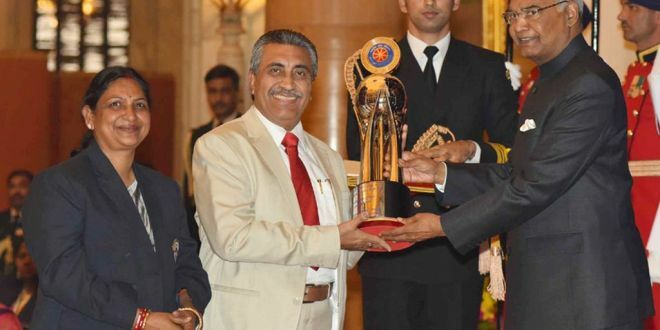 The NHIPC will be working in close co-ordination with various connected Ministries and Departments of Government of India, State Governments, Apex Business Chambers like CII, FICCI, ASSOCHAM, and InvestIndia etc. NHIPC will also work in close co-ordination with Foreign Embassies and Missions in India and Indian Embassies and Missions situated in foreign countries. Objective of NSS Awards: The objective of NSS Awards is to recognize and reward outstanding contributions towards voluntary community service made by the Universities/ Senior Secondary (+2) Councils, NSS Units/ Programme Officers and NSS Volunteers, with a view to further promote NSS. 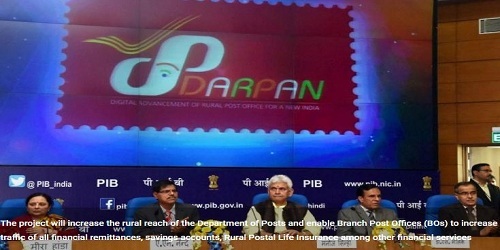 DARPAN – “Digital Advancement of Rural Post Office for A New India” Project has been launched to improve the quality of service, add value to services and achieve “financial inclusion” of un-banked rural population. The goal of the IT modernization project is to provide a low power technology solution to each Branch Postmaster (BPM) which will enable each of approximately 1.29 Lakhs Branch Post Offices (BOs) to improve the level of services being offered to rural customers across all the states. The Project shall increase the rural reach of the Department of Posts and enable BOs to increase traffic of all financial remittances, savings accounts, Rural Postal Life Insurance, and Cash Certificates; improve mail operations processes by allowing for automated booking and delivery of accountable article; increase revenue using retail post business; provide third party applications; and make disbursements for social security schemes such as MGNREGS. 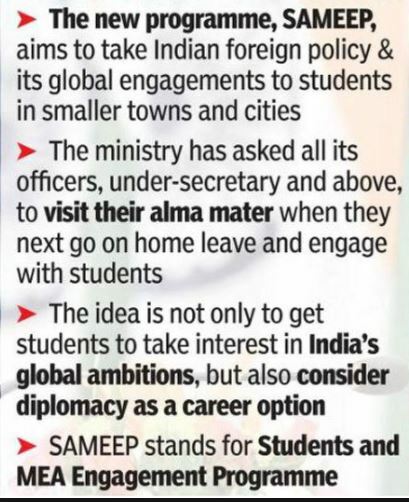 With an aim to bring foreign policy to the masses the External Affairs Ministry has come up with an initiative – SAMEEP – ‘Students and MEA Engagement Programme’. The main objective of SAMEEP is to take Indian foreign policy and its global engagements to students across the country. Under this programme, all the ministry officers – under-secretary and above – will be asked to go to their hometowns, particularly their alma maters. They will be expected to interact with the students about the way the MEA works, basic elements of its policies, how diplomacy is conducted, and generally give students an idea of what a career in the MEA would look like. The officials will be provided a basic standardised presentation by the ministry, but will be free to add their own improvisations and experiences. The agenda of the programme is not only to make students interested and aware of India’s place in the world and its global ambitions, but also to drive interest in diplomacy as a career option. In a move aimed at combating black money stashed abroad, India has signed an agreement with Switzerland that would allow automatic sharing of tax- related information from January 1 next year. A joint declaration for the implementation of Automatic Exchange of Information (AEOI) was signed last month between the two sides here and it provided that both countries would start collecting data in accordance with the global standards in 2018 and exchange it from 2019 onwards. The AEOI conforms to a norm set by global economic body the Organisation for Economic Co-operation and Development (OECD) for tax transparency. Confidentiality and data protection requirements are to be strictly followed under the automatic information exchange framework. This process ensures the signatory always maintains control over its exchange partners and the treatment of the data exchanged, as per OECD. The automatic exchange of information will also discourage Indians from stashing black money in Swiss banks. Indian deposits in Swiss banks have been falling already. India will provide Myanmar with $25 million for development projects including prefabricated houses in troubled Rakhine state to enable the return of Rohingya Muslims who have fled the area. A memorandum of understanding to support development of Rakhine and help create jobs was recently signed. Under this MoU, Government of India proposes to take up, among others, a project to build prefabricated housing in Rakhine State so as to meet the immediate needs of returning people. Besides housing, the proposals include building schools, healthcare facilities and building bridges and roads. More than 600,000 Rohingya have escaped to Bangladesh after attacks by insurgents on Myanmar security forces in August triggered a military crackdown that the United Nations has called ethnic cleansing. The international community demands the Rohingya be allowed to go home in safety, and Bangladesh and Myanmar have begun talks on repatriation, but huge doubts remain about the Rohingya ever being able to return in peace to rebuild homes and till fields. India has been trying to promote economic cooperation with Myanmar to try to push back against China’s expansive involvement in infrastructure development across south Asia. Beijing has also stepped into the Rohingya crisis and proposed a three-phase plan including a ceasefire, bilateral talks and then tackling poverty long-term. 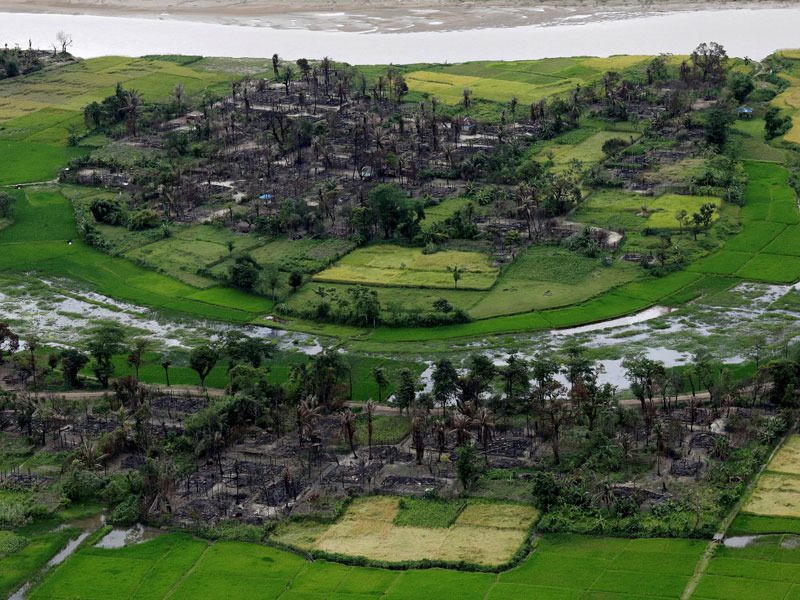 India’s task will depend on how the Myanmar government facilitates the development work. Indian officials have drawn up a detailed plan in the past couple of months. 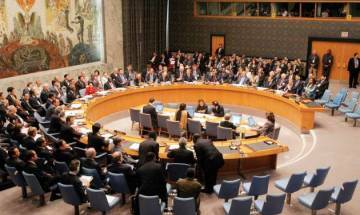 Indian policymakers felt they had to move fast after it became apparent that the Rohingya crisis was pushing the West into its default mode of condemnation and sanctions against Myanmar which India believes to be counter-productive. Context: Indian Coast Guard Ship – Sujay – the sixth in the series of six 105m Offshore Patrol Vessel (OPV) was recently commissioned. About ICGSSujay: Sujay means ‘great victory’. The 105 meter OPV has been designed and built by Goa Shipyard Limited. It is fitted with state-of-the-art navigation and communication equipment and sensors and machinery. The ship is based at Paradip, Odisha under the operational and administrative control of the Commander Coast Guard Region (North-East). Next story 1) What do you understand by cultural capital? Discuss its importance in society such as India.